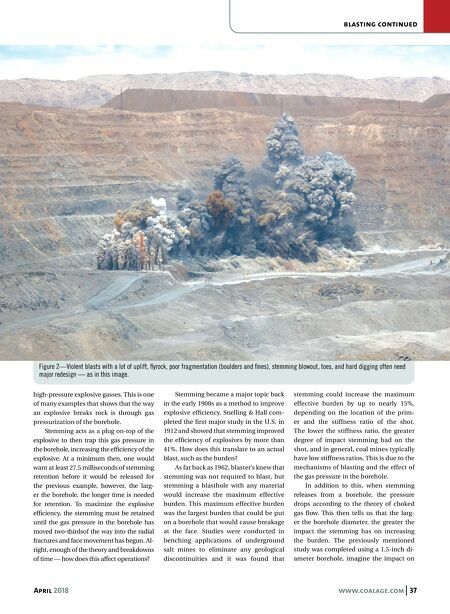 April 2018 www.coalage.com 37 blasting continued high-pressure explosive gasses. This is one of many examples that shows that the way an explosive breaks rock is through gas pressurization of the borehole. Stemming acts as a plug on-top of the explosive to then trap this gas pressure in the borehole, increasing the efficiency of the explosive. At a minimum then, one would want at least 27.5 milliseconds of stemming retention before it would be released for the previous example, however, the larg- er the borehole, the longer time is needed for retention. To maximize the explosive efficiency, the stemming must be retained until the gas pressure in the borehole has moved two-thirdsof the way into the radial fractures and face movement has begun. Al- right, enough of the theory and breakdowns of time — how does this affect operations? Stemming became a major topic back in the early 1900s as a method to improve explosive efficiency. Snelling & Hall com- pleted the first major study in the U.S. in 1912 and showed that stemming improved the efficiency of explosives by more than 41%. How does this translate to an actual blast, such as the burden? As far back as 1962, blaster's knew that stemming was not required to blast, but stemming a blasthole with any material would increase the maximum effective burden. This maximum effective burden was the largest burden that could be put on a borehole that would cause breakage at the face. Studies were conducted in benching applications of underground salt mines to eliminate any geological discontinuities and it was found that stemming could increase the maximum effective burden by up to nearly 15%, depending on the location of the prim- er and the stiffness ratio of the shot. The lower the stiffness ratio, the greater degree of impact stemming had on the shot, and in general, coal mines typically have low stiffness ratios. This is due to the mechanisms of blasting and the effect of the gas pressure in the borehole. In addition to this, when stemming releases from a borehole, the pressure drops according to the theory of choked gas flow. This then tells us that the larg- er the borehole diameter, the greater the impact the stemming has on increasing the burden. 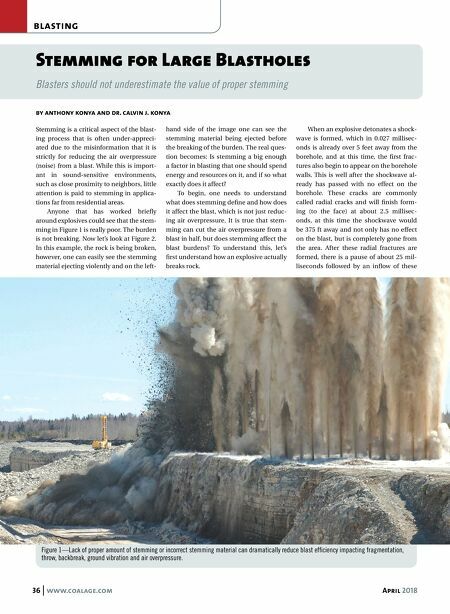 The previously mentioned study was completed using a 1.5-inch di- ameter borehole, imagine the impact on Figure 2—Violent blasts with a lot of uplift, flyrock, poor fragmentation (boulders and fines), stemming blowout, toes, and hard digging often need major redesign — as in this image.